What – Hacking existing research documents. Why – A rewarding and efficient research method which has both width and depth. A great deal of time and effort has gone into existing reports and this process works with this and builds upon them. How – For this process you need a generous printer, a large workspace, post-it notes and highlighters. Find related reports compiled by a diverse mix of forums, organisations and companies. Write each insight or question contained in those documents onto post-its, and stick them up. Once you’re through the documents, start to cluster the post-its by theme. Patterns will start to emerge and questions will start to form. 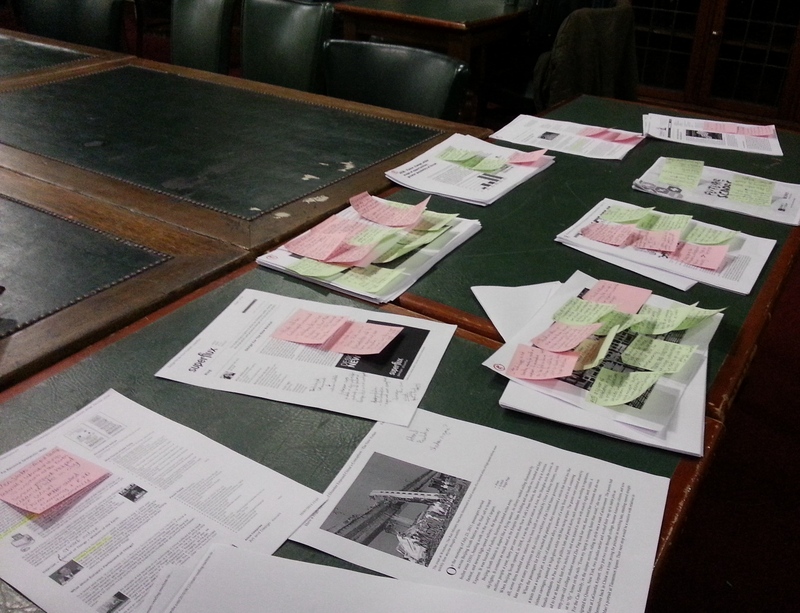 In addition to the main reports, we printed related articles to do with our interests or research areas for the project. This enabled us to not only discover the overall bigger trends, but also have specific smaller examples to inform and connect with the bigger trends. Reference – Process was learned from an article on ‘Gonzo user research’ by Brian Millar, a strategy director at Sense Worldwide. Photo by Duane Harrison, from a speculative project called ‘internet of us‘ which explores the concept of people having the similar qualities as the ‘internet of things’ or ‘spimes’. The process and research we carried out yesterday! The outcomes of this research will be discussed in the next post.